I have nothing useful to say but will be jolly pleased if this works! Also, there's the the MVC Membership Starter Kit which show how to authenticate with the dotnetOpenId assembly, Windows Live ID and of course the traditional forms authentication. I've tried both from work and at home, on Firefox and on IE6/7 to post a comment using my OpenID from Blogspot. It continues to throw an error, so if you are looking through the error logs and notice a few, that's what is causing it. Hm..nothing in the logs...do you have a screenshot? Test while "stay signed in" == true. I like the OpenID Selector. What do you think about letting the user enter a OpenID and a homepage? Not everyone has delegation setup so linking to their OpenID URL isn't always the best action. An error has been encountered while processing the page. We have logged the error condition and are working to correct the problem. We apologize for any inconvenience. Nice work and looking forward to see you at DevTeach! Working well Scott. Great to see your support for OpenID. James, can you check your OpenID Provider to see if your Nickname or FullName are set? This is weird. It's the 3rd time I try to comment with openID. The other two times the comment showed on your page. Then when I did a refresh, the comment was gone! That happened two times already, any ideas? I've been trying to get more synergy between my IT resources of late. Adding the OpenID link tags in the header is perfect. I'll be adding the OpenID comment support to my blog as soon as I can. Ramiro - That may be my fault, I'm slapping bugs as fast as I can and I may have been updating the site while you were submitting. Great post and good walk-through. Thanks for the help on Open ID. I just picked up the new book on Cardspace and am looking to implement it myself. I think this might be the year Open ID gains traction. Would it make more sense for Task 2, to instead of use OpenID to login to dasBlog, instead make dasBlog an OpenID provider, so you don't need a service like myopenid? One other thing I noticed after I just left this comment. It appears that you use as a link back to me in the comment section the URL for my OpenID provider (in this case nickschweitzer.net which redirects to nickschweitzer.myopenid.com). However, when I setup MyOpenID, I created multiple "personas", and for this comment, I asked that my "Coding Monkey" persona be used. That personal links to www.thecodingmonkey.net. Is there a way for you to determine that in the response and use that URL for linking purposes instead? Nick - From my point of view, if we make DasBlog a Provider, then we suddenly are out of the blog business and we're chasing cool futures like all the OpenID providers. I don't want to implement SmartCard support. ;) Let the providers push the envelope and I'll pick the one I like. My OpenID won't change. Very cool - I'll have to switch my personal site over to OpenID. What are your thoughts on using this in place of new account creation? Maybe use this in forum software and just have them enter any additional profile info and have that mapped to their openID? So, my blog is now setup as my OpenID identity. Been meaning to do that for a while. It is amazing how effective a gentle reminder can be. Great blog. Dave - Exactly. Most good OpenID-using sites don't actually ask you to *create* an account. The idea is that it turns folks off..."create ANOTHER account?" So you offer "Create" and "Login with OpenID" and it's all automatic. You don't even need to store profile details because you can get them from the OpenID provider by requesting them. Great post! 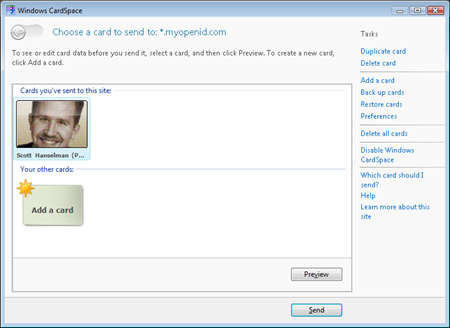 I still wish that the Cardspace integration in Firefox were better. I'm trying out http://www.codeplex.com/IdentitySelector because it uses the same UI as IE does with Cardspace. I have to admit, though, that Cardspace usage still doesn't make a ton of sense to me (from an end-user's perspective). Like, if I should be storing my cards on my flash drive so that I can use them between computers, etc. Scott - However it is not unreasonable to expect that many sites may ask you to fill in additional profile details that are not covered in the OpenID spec or that are not approved for transfer by the OpenID provider. A great example of this is the age check that is required on many ecommerce sites in order to meet certain laws in the US. Again, as you said not that you have to use Cardspace with OpenID. Joe Brinkman - Yes, and that's why there are extensions to OpenID to request things that aren't cover by the spec (see my ClaimsRequest example). If folks want height or weight or whatever, they can still host it at the Provider and it can still be requested by the Client (RP) as I understand it. I just started looking into this, the website I use frequently for development (www.unfuddled.com) just started supporting it which ROCKS! On another note, it's fun to see my friend Aaron getting the world straightened out about blog comment authentication and things. I too find it very frustrating trying to login or not login, or maybe setup a whole different account to login and comment on blogs. Very frustrating. Sorry, but since there is no "preview", this is the only way to test what happens when I select OpenID. Don't apologize! Test on testers! Thanks Scott, it works now! test. using my blog url. Excellent post, glad Aaron made the post when he did, sure has stirred up some excellent discussion. Lets all demand OpenID! yay test to see if this works. For instance, I have previously commented on your blog, so my "details" are pre-populated. I can now put in my openId. Is it going to pull my email from the openId or the E-mail field? If my OpenId profile website field has no value, does it pull the "Home Page" value from the details section? Anyway, I've been struggling with issues like this on a project that I've been working on. Whenever there is a new paradigm, figuring out the optimal way to go about things is a challenge. I implemented auto-sign-up using dotnetopenid and I have a method for signing in if you don't have an openId -- but I did some user testing and people were putting in their openId and then additionally filling out the info for the other type of login as well. Basically, it seems that the lowest friction method for setting up a non openId account is to ask for a username / password, send an opt-in email, and confirm the account when they return to your site via an email link. 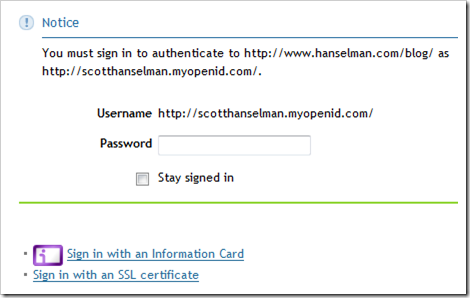 OpenId is cool and it is really strong from the perspective of low friction for the initial sign-up process. Still, it would be a good idea for the community to come up with some sort of consensus of how to integrate OpenId with the flow of a normal "username / password / email confirm" login process since not everyone jumps on the hayride at the same time. You would probably lose a lot of users if you only allowed authentication with OpenId. I like Thomas Freudenberg's idea about using a subdomain. One thing that bothers me in the OpenID space is that while Yahoo and Google both act as OpenID providers they themselves don't allow logging in using OpenID. I'd love to log into Flickr or Google Analytics using OpenID vs. yet another set of logins. Another OpenID area that needs developing is new signups. A lot of places offer OpenID authentication only *after* you've gone through a lenghty signup process when most of that information could have been pre-populated via OpenID. The same even goes for your comment authentication, it seems an AJAX call could be made that shows the Name, EMail and Homepage once the user tabs away from the OpenID box. * Any volunteers want to write me a JQuery that disables the 3 fields of the OpenID is filled out? and vice versa? Shawn: Dude, preach on. The big players don't *get it* yet. I see the advantage of openid and want to use it on my latest solution. Scott - While the OpenID 2.0 spec added support via the OpenID Attribute Exchange spec this is still a problem since that spec is not widely implemented by the OPs or RPs. As a result there are still a large number of common properties that are not provided for in the original OpenID 1.1 spec and that are requested by many websites. Also, it should be noted that the user may or may not have provided all of their profile details to the OP or may have denied the request to provide the profile data to the RP. In this scenario, the RP still needs to have a mechanism in place on how to deal with some profile attributes which are not provided by the OP for whatever reason. Ok, you ask for tests but how many tests can one man handle. I just wanted to test what would happen if I entered all the details above (my openid as well as the usual details). Sorry to spam your blog with comments Scott, but it's disappointing that neither my OpenID Persona image, nor my gravatar shows if I use OpenId. Vaibhav - Your Gravatar isn't showing because you haven't entered your email in your default persona on your OpenID provider's site. The Gravatar will display if you have set your email, as I request your email when you login. You also haven't set your "Nickname." Well, looks like I have tied Vaibhav in terms of spam. Sorry for the bother :( but testing is fun! Thanks for introducing me to OpenID! I had heard about both Cardspace and OpenID in passing but had never really investigated either technology too deeply. Testing blog openid url... The first post linked to myopenid page instead. Does this really work? Do I still remember my OpenID? Nice work. Now I *really* do need to upgrade to the latest build of Das Blog. The selector isn't providing a good default for yahoo IDs. The template should be https://me.yahoo.com/ . One last thought -- you might ask JitBit to add OpenId authentication to their forum software. Ok.... Did I set my Blog up correctly? -Rory = According to MyOpenID they aren't sending the Persona's Webpage yet (see comment above). Works :) .. one up ... My site works with OpenId too. I just set up my personal website as my OpenID last week. It was surprisingly easy, and I'm digging the user experience so far. OpenID redirect from my blog. Nice. /// Note, that straight after login, forms auth will redirect the user to their original page. So this page may never be rendererd. e.Cancel = true; //Need to cancel or the control will log us in for free. Eek! Gah. That friggen button next to the openid textbox just screams "HEY! CLICK ME TO AUTHENTICATE! LOL UR STUPID". Are there any plans on integrating this into the official DasBlog source? just testing with my claimid openid -- I got a .NET error the last time I tried to leave a comment with it. Got OpenID support for comments running on my .net blog - sweet! Cool, this worked, now I have my blog as an OpenID. What a great way to get comments! Where do you install the nice selector in wordpress? do you have to hack into the core of it? testing - thanks for a thorough and comprehensive post! 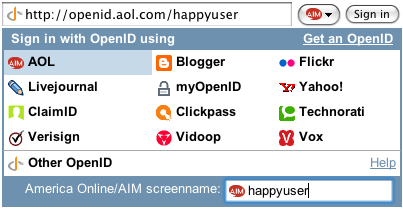 Question about the OpenID ID Selector, and OpenID in general: suppose I trust Yahoo and Flickr, but I've never heard of Vidoop or Vox (which I haven't, BTW). Can I lock down to only accept OpenIDs from folks who keep their IDs at places I trust? Or if I support OpenID, do I have to support all of them? Verisign comment test. Kind of worried this won't give me a picture. I was trying to setup my dasblog based blog (it's in godaddy) to use openId. I had the blog running with the latest release, but I haven't been able to when using a build supporting open id. Do you know if the openid capable versions have some issue regarding using medium trust? Any tips on enabling openid? The code is up at http://www.codeplex.com/dasblog !